I felt so bad for my little guy when he started teething, especially because he was never a fan of those frozen rubber and plastic teething toys. Having given up on teething toys, someone recommended that we try frozen bagels. He loved it, but it was extremely nerve-racking because big chunks of bagel would break off and I was scared he would choke. Plus, I'm not a big fan of the fact that there are so many questionable ingredients in some of those mini bagels. So, that's when I decided to try a frozen pancake instead. I used this recipe (via. Mountain Mama Cooks); substituted baby formula instead of milk, eliminated the honey, threw them in the freezer and boy was it was a hit. It gave him something cold to chew on that he could actually break down if he gnawed off a chunk in his mouth. He could hold it easily with his own two hands and really seemed to enjoy it! Obviously I still had to keep a close eye on him, but overall we had no issue. 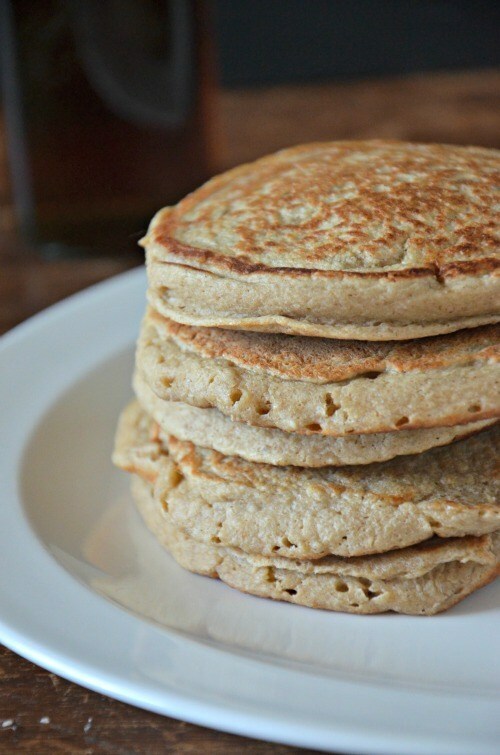 To this day this pancake recipe is a staple in our house (minus the baby formula) because it's healthy, delicious, easy to make, has multiple uses, and satisfies the whole family! The only problem is, every time I try to make a big batch they get gobbled up before I can freeze some for later. This one is definitely mom-approved! Enjoy!